With a comic like The Rocketeer it is important to not take the work too seriously. Given that, this book works nicely but could still be much stronger. It is the 1930’s, America (Hollywood, of course) and Cliff Secord is a man looking to be a hero and dons a helmet and jet-pack to take on whoever needs taking on. There are goons a-plenty looking to take Secord’s jet secrets and that puts his dame, Betty, in harm’s way. This is an over-the-top, cartoon-y graphic novel. The story-line is generally pretty sound, but it features some real stereotyped characters. The villain is using mass hypnotism to cloud people’s minds, which strikes me as a very 30’s-era sort of move (and of course the idea of clouding minds harkens to The Shadow [also a 1930’s era creation]). I wasn’t a fan of the art style. I couldn’t tell if it was trying to be retro or just ‘simple’ so as to appeal to the youngest of the comic-book-reading crowd. In fact, that was my biggest problem with the entire book – who is this for? Who is the target audience? It’s a just a little corny for the serious comic/graphic novel reader and a little to mature for the kids who may be drawn to the art style. It strikes me as the sort of book one might give as a gift. I would read this, enjoy it, but then probably donate it to my local library or used book store. I like the concept – I’m still a huge fan of the classic pulp heroes of fiction, but this isn’t an homage to the pulps as much as it is an homage to Disney’s Donald Duck comic books. Looking for a good book? 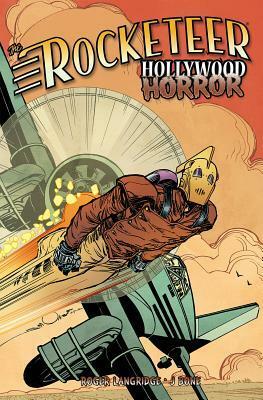 Rocketeer: Hollywood Horror is a graphic novel featuring pulp hero-like character, complete with jet-pack on his back and gorgeous dame at his side, but it’s a little too corny.